In 2006, I boarded a plane bound for Japan, full of nerves and anxious about the adventures that lay in wait. I hoped to see true Japanese tuning somewhere, somehow, but I never quite expected to end up lucky enough to call some of the biggest Japanese tuners my friends. I was once told that travel is the only thing you can purchase that truly makes you richer, and, as it turned out, they were right on the money. I guess my time exploring Japan can be summed up in one Japanese proverb — ‘I am unable to call it love, but unwilling to say it was just a dream’. I spent six years completely immersed in Japanese culture, meeting some of the biggest names in tuning and treading some of the most famous tarmac. It’s a combination of experiences that I have loved to share with NZ Performance Car in the hope that its readers would one day venture over. For that reason alone, I want to share my top-10 experiences, as well as some helpful tips for those keen enough to take the plunge and get on a plane. I mean, let’s be honest, you won’t remember the time you spend working in the office or mowing your lawn, will you? So, in no particular order, here is where you should head for your own bit of Japanese-tuning heaven. This place needs no introduction. It is the holy grail of drift venues and one of the few places that deserves the title ‘hallowed ground’. These ribbons of tarmac, nestled high in the mountains of Nihonmatsu, have caught out the world’s best and given birth to legends. Standing on the wall of Minami at 2am while drift cars howl past, tyres screeching, the smoke lingering in the inky-black night air, is an experience that sends wave after wave of shivers down your spine. Stop for a moment and look around — the faded paint, the crash marks on the walls, and the pieces of broken car scattered throughout the tracks — it all makes the ghosts of the past suddenly feel very real. I struggle to accurately describe Ebisu with words — it isn’t a drift compound; it is a living legacy to the art of drifting. This is the Japanese way of greeting someone. Put your hands at your sides and tilt your upper body 45 degrees forward. The whole concept of bowing is a direct reflection of status — if you meet a person of a higher social standing, you put yourself in the more ‘vulnerable’ position of the bow to prove you don’t harbour any ill intentions towards them. It is used as a greeting, a way of thanking someone, apologizing, congratulating, and asking for a favour. Japan isn’t a country that is touchy-feely, so bowing is always the best way to go when greeting someone, rather than reaching for a handshake. Witnessing the birth of a modern automobile is a surreal experience, and standing on a gangway above a production line with one car rolling off every minute is simply mind-bending. Mazda gives you the full automotive experience, showcasing its proudest automotive moments, as well as showing you the brilliance of just-in-time manufacturing. Upstairs in the museum, you will come face-to-face with the original Le Mans–winning 787B race machine and a raft of other famous cars that have shaped Mazda into the iconic marque it is today. A total in-house operation that sprawls for more than 1.6km2, it even has its own port for shipping cars and parts around the world. Just as you are unlikely to speak fluent Japanese, the tuners are unlikely to speak fluent English. Before jumping on a plane, be sure to learn a few basic phrases. It doesn’t matter how wrong your Japanese is when it leaves your mouth, as long as you try, then you are safe in their eyes. Most Japanese people are terrified of foreigners for one reason — they will speak to them in English. If you do have to use English, remember Kiwi slang doesn’t count — it is a Nissan Skyline, not an ‘RFB’. If you appreciate tradition and original style, then you should look no further than the original home of badassery. Mitsuru Haraguchi is a tuner who has remained true to his roots, balancing functionality while refusing to compromise on aesthetics. 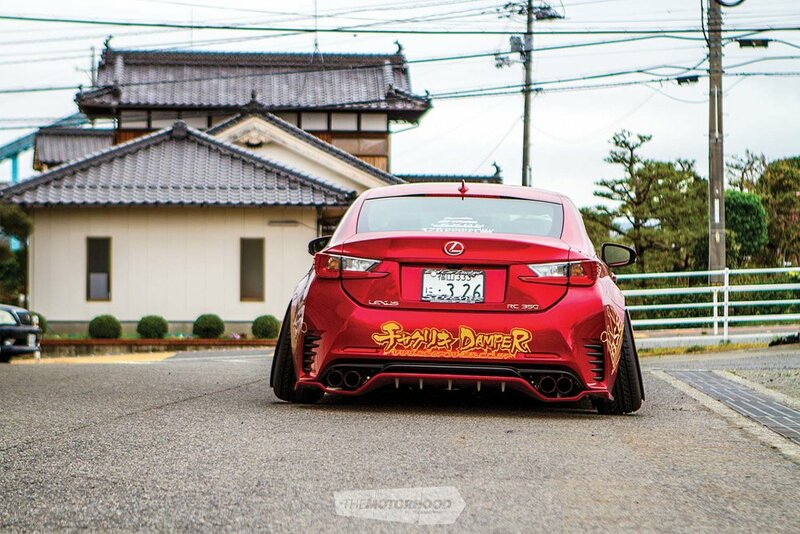 Famous for crazy levels of static camber and not caring what others think, he has earned a reputation as one of the most colourful tuners in Japan, creating visions unlike anyone else. Considered by many to be one of the OG drifters, his wild FC3S is the stuff of legend, while his more recent creations symbolize the tuning flavours of Hiroshima. Haraguchi-san runs with the outlaws, builds opinion-dividing cars, and takes risks in his artwork. 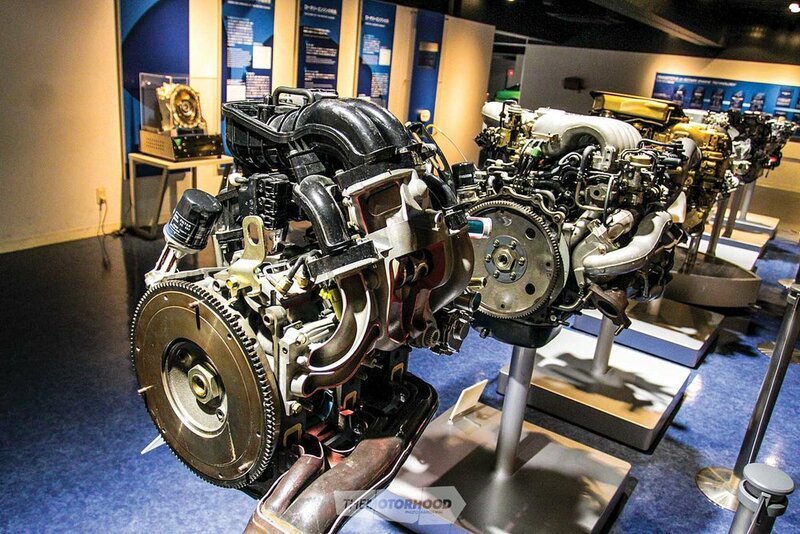 That he remains true to his beliefs makes 326power a must-see automotive experience. After greeting you, many of the tuners will quickly thrust a business card upon you. This is a formal style of introduction in Japan, with the aims being to aid remembrance of each other’s name and aid future correspondence. Always receive a business card using both hands, and throw in a little bow for extra brownie points. Look at the card for a while and show some interest in its contents, as most people in Japan are quite proud of them. Afterwards, make sure to put it in your wallet, not in your pocket, as that is considered extremely rude. If you are given a souvenir or gift by the tuner when you leave, once again, receive it using both hands to show proper gratitude. For a long time, the doors to the ninth wonder of the world were off-limits to the public, but, from time to time, they open up to reveal one of the world’s most insane car collections, and your guides are the very passionate men who designed the classics before you. If you are a Nissan fanatic, then this is the holy grail of automotive experiences. The official home of ‘Godzilla’ was created to drag designers out of a slump after modelling drab four-door family cars all day long, and is now home to over 300 cars. 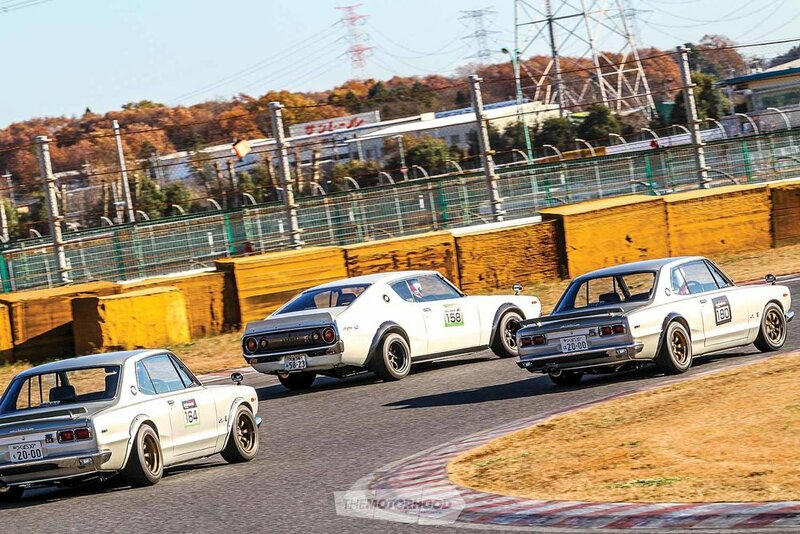 Nothing will ever prepare you for the sight of almost every single Nissan car and racer ever made, all under one roof. The Calsonic R32, Hasemi Skyline Super Silhouette, Xanavi R35 Super GT 500, and Nissan R390 GT1, to name just a few, now call this place home. Whether it is to take a photo, use the toilet, or take a look at cars in the workshop, make sure you ask first. You may have seen a million photos of the workshop on the net or in magazines, but the workshop is still private property, so never assume anything. Many excited tourists have got into trouble at tuning shops after bowling up and snapping away without asking first. Tec-Art’s is a relatively unknown garage hidden away from view out the back of Saitama. Specializing in Toyota 86 tuning, it has been called the world’s foremost authority on everything Hachi-Roku, and the proof is in the pudding. Iconic cars scattered around the workshop include the purple 16-valve N2 machine that pounds the pavement at Tsukuba and Keiichi Tsuchiya’s personal 7A-GE 20-valve Hachi-Roku. The head mechanic, Kamata-san, receives cars sent to him from all over Japan, and, being trusted by the real drift king, Keiichi Tsuchiya, to spanner his personal car is quite an honour. Tec-Art’s doesn’t just tune 86s; it lives and breathes them, too. Kamata’s daily is a black limited edition, tuned and pushing an engine package worth north of NZ$30K. Besides the top-shelf machinery, Kamata and his crew are down-to-earth people who love sharing their passion with others. They are excited to welcome guests from all corners of the globe, who come to witness what they do. Many of the tuners we trek 8000km to visit are busy people, with a crazy schedule all year round. If they take a little time out of their busy day to take some photos with you or show you some of their creations, the more times you thank them, the longer they will be likely to dedicate to you. A few simple utterances of arigato is all that will be needed; if you add in a little bow at the same time, you’ll be halfway to being a local. Kei Miura has skyrocketed himself to the forefront of Japanese tuning with his wild aero, wild hair, and wild old-school style. I can hear some groaning ‘it has been done to death’, but those are the calls that keyboard warriors will throw out at any given opportunity. This man has an aura that you just don’t see on the net. He doesn’t care about trends, he doesn’t care if you are a fan or a hater, and, at TRA Kyoto (yeah, it’s not only known as ‘Rocket Bunny’), the ’70s have never really ended, and time just seems to stand still. Leather flying jackets, baggy jeans tucked into unlaced leather motorbike boots, all topped off with the famous teased hairstyle makes for a man truly ‘born out of style’. His wild car designs are built out of a love for illegal midnight highway racing, and the man himself is a legend in the scene. So, forget the ‘cut and paste kit’ line so often thrown around by those keyboard warriors; stop in and meet Kansai’s most legit Kanjo racer in person. It sounds a bit odd, but noisy excitable foreigners will always get death stares from the locals. Loud talking in public isn’t really a socially acceptable thing in Japan, so be mindful of your volume. This is especially pertinent on the trains, where you should really keep the noise to a minimum, as, let’s be honest, the whole carriage doesn’t want to hear you telling your mate that you couldn’t work out what you just ate for lunch. 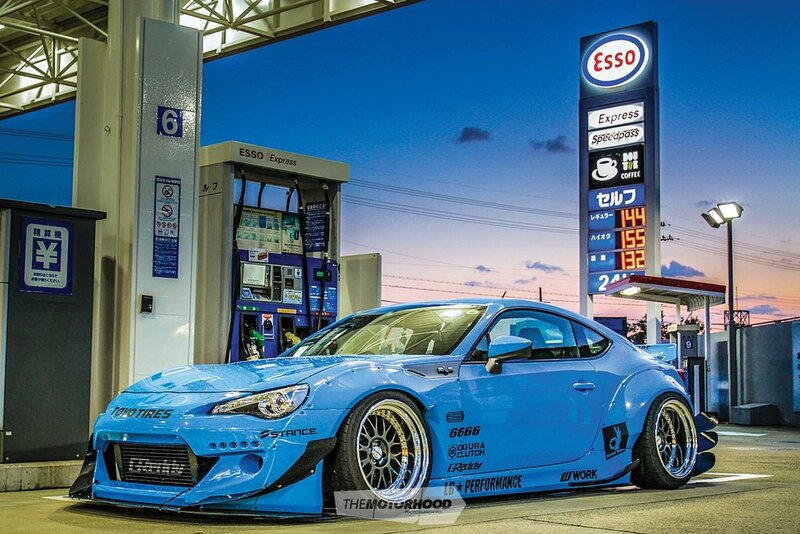 By day, Yukimitsu Hara is one of Japan’s leading automotive LED experts, whose work is commonly found adorning VIP Tokyo Auto Salon show cars, but he also has another well-known interest — time attack. If you aren’t familiar with the face, you are probably familiar with the car he pedals, an unforgettable FD RX-7 that pounds Tsukuba in 56 seconds. The Zest Racing–prepped 13B pumps out 395kW and is one of the most beautiful Wankels that I have ever had the chance to photograph. The coolest thing about Hara-san is that the RX-7, which used to be his daily, has been developed in line with his own vision of what a time-attack RX-7 should look like. And that’s a vision that continually changes and will never be considered complete. As far as company vehicles go, this one has to be right up there! If you appreciate attention to detail, and a race car that could quite happily pass as a show car, then this is a must-see. If you have stinky feet, deal to it before going. Japan is very much a shoes-off culture, and, at many places, you must take your shoes off at the door and wear indoor slip-on slippers. There is nothing worse than going out to dinner and finding someone’s socks are higher than the grilled fish. RAUH-Welt Begriff (RWB) is now a global phenomenon, so you probably wonder why you need to head to Japan to experience it. After all, we already have ‘Waikato’ and ‘Hekigyoku’ here in New Zealand! If I am bluntly honest, the pull factor behind this brand isn’t the cars; it’s primarily the man behind them, and to fully understand RWB, you need to visit the man cave in Chiba. Nakai-san’s dimly-lit workshop is doused with odours of Sikaflex and paint thinner, while Pandora One plays softly in the background — and it all gives you an insight into the inner workings of his mind. He is truly an artist who went against the grain, didn’t abide by the status quo, and forged his own reputation out of a never-waning passion for what he does. Some things you can’t explain, you simply have to experience them to understand — this is one of those. Don’t fangirl to the point where you are too afraid to speak to them; talk with them as you would any other person. They don’t see themselves as anything special and don’t really know how to deal with being told how amazing they are. Many are incredibly humble and will appear more excited that you are there to visit them rather than you are to be visiting them. It is a weird feeling when Kato-san wants to take photos with you everywhere you go, but just roll with it (and don’t forget to find a gold sparkle helmet to wear in photos). If you do find yourself whisked off to dinner with Nakai-san, when the big bottles of beer come out, don’t go pouring your own beer — you should always have someone else pour your drink. Use your initiative by grabbing the bottle and pouring the bossman a drink first, then your fellow friends. Finally, put the bottle back and let someone pour your drink. Remember to toast with everyone by saying kanpai before drinking. Last, but certainly not least, a tuner who likes to take all the glitz and glamour of Europe and drizzle it with classic Japanese bosozoku icing. Wataru Kato is one of the most colourful characters you could ever meet — you won’t catch too many people grinning while slicing the fenders off a Ferrari 458 and a McLaren 650S; Kato-san dares to be different. He is another tuner who has never for a second sought anyone else’s appreciation for how he builds, and every single car in his arsenal has been built to personal taste. He is out to have fun, no matter how serious a situation he finds himself in. Not even a magazine shoot is safe from a profile photo showing him wearing a sparkling gold helmet while balancing on one-foot and shouting “Banzai!”. He might come across as a wild child who never really grew up, but he is actually one of the most traditional tuners I have ever met and takes etiquette very seriously. Omiyage literally translates to ‘souvenir’, and, often when you visit, before you leave, tuners will give you a little present to thank you for coming. Items such as T-shirts and stickers are common omiyage. If you know you are visiting a couple of shops while in Japan, grab a little something from New Zealand and offer it when you arrive at the workshop. You will be surprised how something as simple as a block of Whittaker’s chocolate can be traded for JDM goodies! Grab a print copy here! I am proud to be associated with NZV8 and NZ Performance Car, shooting in both New Zealand and Japan. Brought up as a rallying fanatic, at 15 I started taking photos of airborne stones with a point-and-shoot camera at the Rally New Zealand. While overseas I took up photography again to try and document the amazing places I was going and the things I was seeing. I enjoyed it much more than I expected to and it has turned into a real passion. Most of my recent photography has been done in Japan, based around the local tuners spread from Tokyo to Hiroshima. It is great being able to shoot everything from time attack machines at a freezing cold Tsukuba Circuit to tubbed drag cars in the hot Masterton summer sun. It is awesome getting to shoot these impressive works of art, but equally as much fun getting to know the people behind them.